You can use NX, Solidworks (installed on the computers in B100), or sign up for OnShape, a free, browser based CAD program. Use a real mouse, with scroll wheel. You can get by using your laptop trackpad, but a mouse makes things so much easier. Save your CAD model as a .stl file, and print it on one of the three Monoprice 3D printers in B100 using Simplify3D. Use the standard temperature, speed, and dimension settings. The blue tape does not need to be perfect, try to print on a flat spot until all of the tape has been printed on, then replace it. Practice loading and unloading the printer. Use the printer menu to turn on "Preheat". When the extruder is hot, push the lever to disengage the drive motor, gently push the filament into the nozzle, then pull it out. To load, feed the new filament in until plastic starts coming out of the nozzle, as if it were a glue gun. 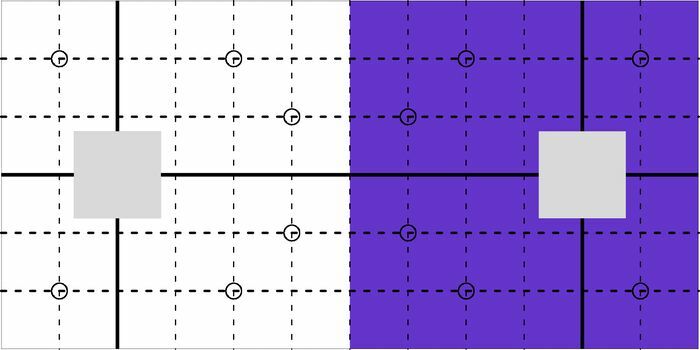 Assignment: Design and print a 1"x0.75" rectangle 0.5" thick, with a 0.5" diameter hole in the middle. Measure each dimension with calipers and note how much the size differs from your digital model, and email Nick the results. Our laser cutters can only make 90 degree cuts. To build something in 3D, you have to design 2D objects that fit together like puzzle pieces, using crenellation or right-angle dovetails. Rather than using glue, embed nuts and slots for screws to assemble the parts. Assignment: Design 3 sides of a 2" cube that assemble with right-angle dovetails and 4-40 t-slots. Assemble the design in CAD. The Metro Mini is a smaller version of the Arduino UNO. There is a lot of code available for the UNO, but it is slow, with limited memory. 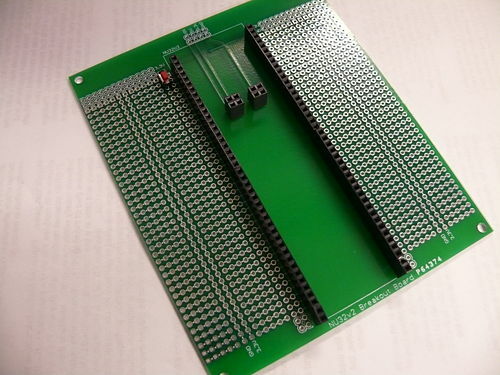 The SAMD21 is similar to the Arduino Zero. It is fast with lots of memory, but the sample code you find online might not always work. 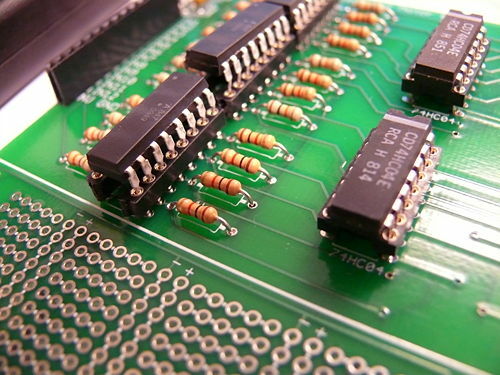 Install the drivers and add the board profile to the Arduino IDE. 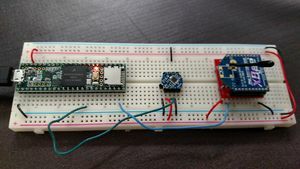 Assignment: Write code that, when you push the button, reads the potentiometer, sends the value to the computer, and sets the LED brightness proportional to the potentiometer angle. Assignment: 3D print or laser cut a mount for the motor. Write code to set the speed of the motor proportional to the potentiometer angle and match the servo angle to the potentiometer angle. The SAMD21 breakout board has a max input voltage of 6V. It will burn up if you use 12V. 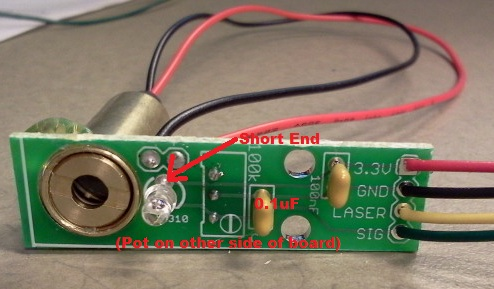 Use a USB battery to power the board, or wire up your own 3.3V regulator. The Metro Mini breakout board has a max input voltage of 16V, so it should be ok to power it off 12V. The h-bridge is from Pololu. VIN is the motor voltage, between 2 and 16V (use 12V from the battery). 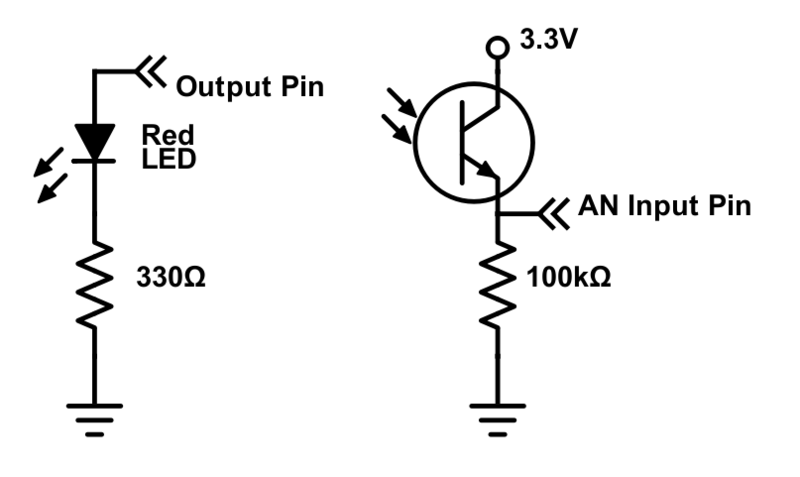 VCC is the logic voltage (3.3V or 5V). Do not use 12V. Wire the PWM pin to VCC, then use a PWM signal on INA to set the motor speed and a DIO pin on INB to set the motor direction. Each team gets 2 12V rechargeable lithium ion batteries and a charger. 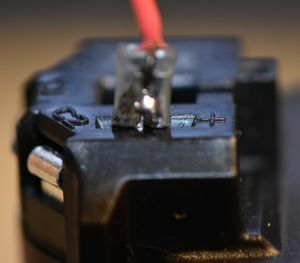 Shorting the battery will draw more than 10A, generating a huge spark and destroying your circuit. Be very careful! Use a quick-disconnect terminal to plug into the battery. 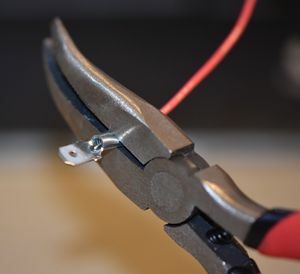 Next, strip off some wire, so that you can crimp onto the insulation and the wire. 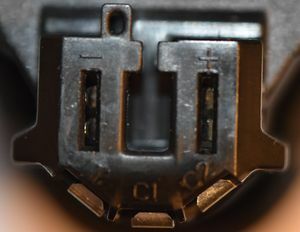 Then, crimp the back of the connector, on the insulation of the wire. Then crimp the front of the wire. 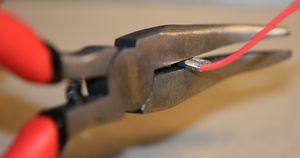 See if you can 3d print something to hold the red and black wires, so that it can be plugged in only one way (to prevent accidental backwards connections that will destroy your circuit). 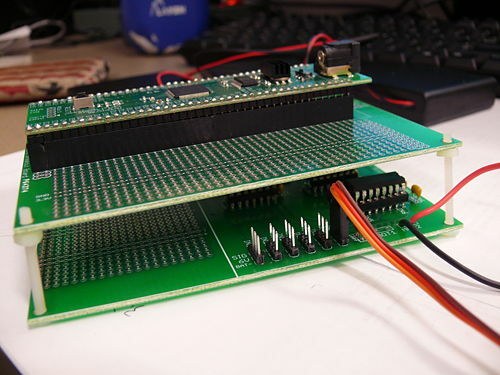 Build a DC2015 Control Board: the blue board! 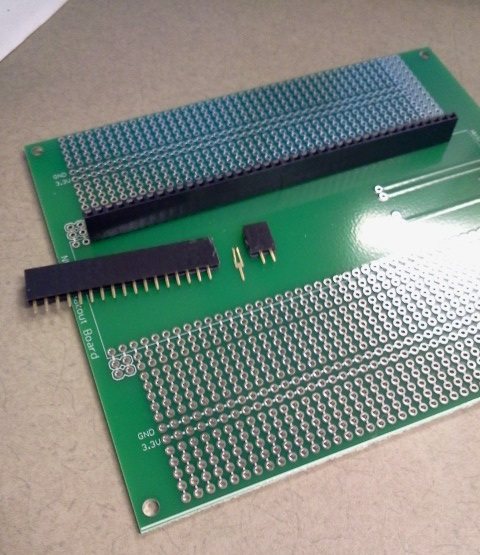 Build a DC2015 Expansion board: the black board! 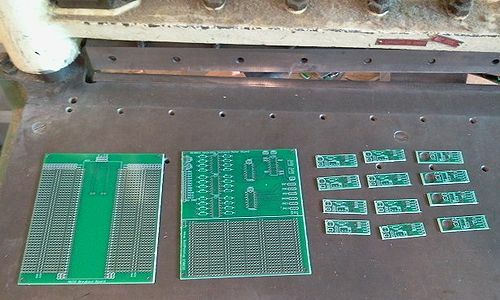 Build a DC2015 Protoboard: the green board! 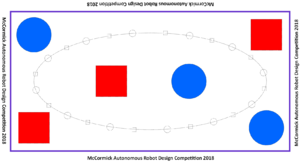 Sample code for a simple line following robot using 2 DC drive motors, 3 analog inputs from IR line sensors, output to the Nokia LCD. Also included, sample code for the IR proximity range finder for the NU32, and an .stl for a range finder cap to block light from the LED hitting the sensor. Show off your Demobot, made from a deconstructed Prey robot DONE! Complete the assignment here: DC2013milestone2.pdf DONE! Complete the assignment here: DC2013milestone3.pdf DONE! 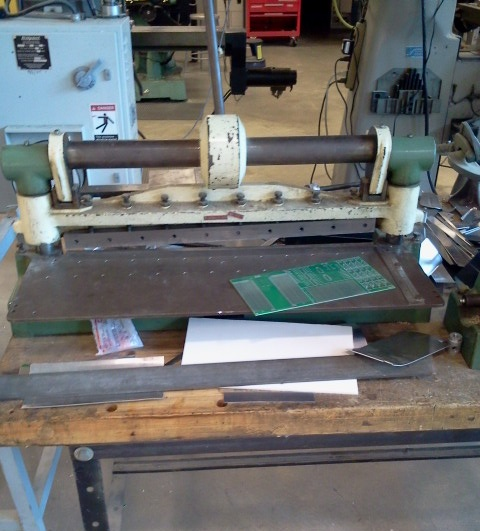 Design and build a robot gripper or mechanism DONE! Sweep the laser, find the target, and point at it DONE! Use female header pins to attach the NU32. 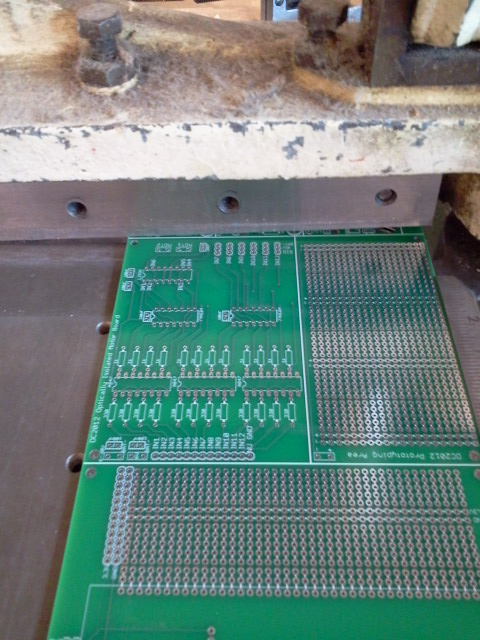 The headers come is sets of 20 pins, so you will have to cut one up. Note the orientation of the LED an phototransistor, they are polarized! 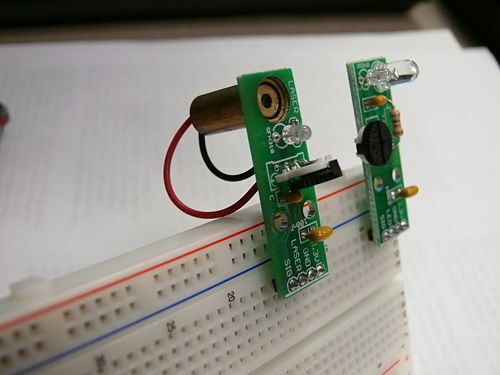 On a button press, read the value of a potentiometer and change the brightness of an LED accordingly using PWM. Note: Do not use an h-bridge or motor as previously assigned. Due before Workshop 2 on Wed, 2/9. Due before Workshop 3 on Wed, 2/23. Link to all sample PIC code here. This page was last modified on 16 April 2019, at 17:52.